America today insisted that India do more to reduce its dependence on oil from Iran and expressed dissatisfaction with Pakistan's handling of terrorism. Visiting US Secretary of State Hillary Clinton met key Indian leaders and discussed a range of issues, including China, regional security and civil nuclear cooperation. 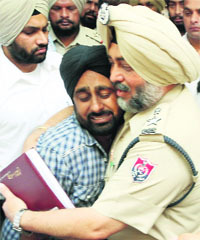 Eighteen persons, including six women and five children, were killed in a head-on collision between a Canter and a truck near Ghal Kalan village on the Moga-Ferozepur national highway in the wee hours here today. India today told Bangladesh that it was trying to evolve domestic political consensus for an early conclusion of the Teesta river water-sharing accord with the neighbouring country. 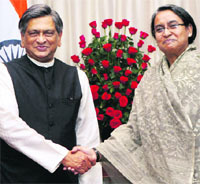 Foreign Minister SM Krishna with his B�desh counterpart Dipu Moni. In a bid to appease foreign investors, Finance Minister Pranab Mukherjee today put off the implementation of the controversial tax evasion measure, General Anti Avoidance Rule (GAAR), for a year and also offered sops to jewellers by rolling back duty hike and real estate transactions but did not climb down on taxing Vodafone-type transactions. HARYANA: State in a fix: Who to hand over children to? Six months after he threw open a debate on revocation of the controversial Armed Forces Special Powers Act (AFSPA) from parts of Jammu and Kashmir, Chief Minister Omar Abdullah today said he was hopeful of a significant development in the matter in the months ahead. The crisis in the BJP�s Rajasthan unit continued on Monday as more party legislators came out in support of former Chief Minister Vasundhara Raje and demanded that she be made the state president to lead the party in the Assembly polls next year. The government today specified that under no circumstances it would ever go in for privatisation of water resources in the country. �The answer is no and it will remain a no. It can never happen that we sell off any of our water resource to a private party�like a river, it cannot be sold off,� Water Resources Minister Pawan Bansal told the Rajya Sabha in response to a query on the issue.